"I1a" is the haplotype of the larger family the Plumnelly Hardins belong to. View and contribute to the files section and the discussions. The group owner is Travis Hardin. Misc: Beaufort County NC land transfers 1706-1833, Hardings (beau.pdf). "Plum out of Georgia and nelly out of Alabama"
(Revised April 10, 2007) If you have Hardin ancestors in Cherokee, Etowah, or southern Tuscaloosa Counties, Alabama or in Floyd County, Georgia, you may be at the right page. Please click on the genealogy chart from Genealogy Home to look for your ancestors. 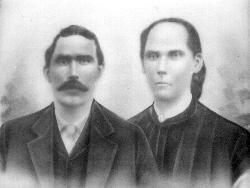 This group of Hardin brothers came into Alabama in the 1830's and 1840's from Anderson, South Carolina, where their father, Aaron Hardin, Sr., owned land on Twenty-Six Mile Creek between Anderson and Pendleton. The senior Hardin, born in Virginia about 1774, had come into the Pendleton District (later Anderson County) before 1797 (He witnessed a deed there on 2 Jan 1797), and in 1805 bought 195 acres. He made fur hats for a living, likely trapping the animals himself. While living there, he and his wife (name possibly Rhonda, b. ca. 1775) had nine males and four females who lived past infancy. It has been hard to find any hints of imformation on the females. Of the males that I shall tell about, Eli, Joseph J., and Milton R. have the most tenuous connection as brothers to the rest. Nevertheless, the Hardins named below, except William, ended up in Cherokee or Calhoun counties in Alabama or adjacent Floyd County in Georgia. They all lived just about on the state line, making them all roughly contiguous. In the late 1840s every city in the United States had its own “daguerrean artist,” but the date of this picture is unknown. 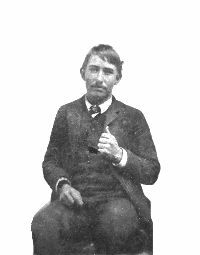 My ancestor Aaron Hardin,(Jr.) appeared to be living with older brother William in Anderson County, South Carolina in 1830. In 1833 or 1834 that household migrated to southern Tuscaloosa County, Alabama with younger brother Asa. Asa and Aaron received land patents of 40 acres each and farmed adjacent to each other. Aaron married Adeline Alexander Holmes, a sister of Asa's wife Annis Ann Holmes. Brother William T. Hardin had married Katherine Smith back in South Carolina. There is no record of his land patent. He didn't leave much of a trail. But William T. Hardin and his wife Catherine Smith lived out their life in Hickman's, or Ralph. Some of his boys were landowners and farmers. Going to Cherokee County around Christmas 1840, Aaron joined older brother John. John Hardin (b. 1806/5) came with his wife Sarah to the area later known as Bluffton, southern Cherokee County between 1833 and 1835. In 1830, John had been living beside his father on Twenty-Six Mile Creek in South Carolina. Asa A. Hardin sold his Tuscaloosa land to nephew Warren J. Hardin, son of William T. Hardin (which see) sometime before 1850. 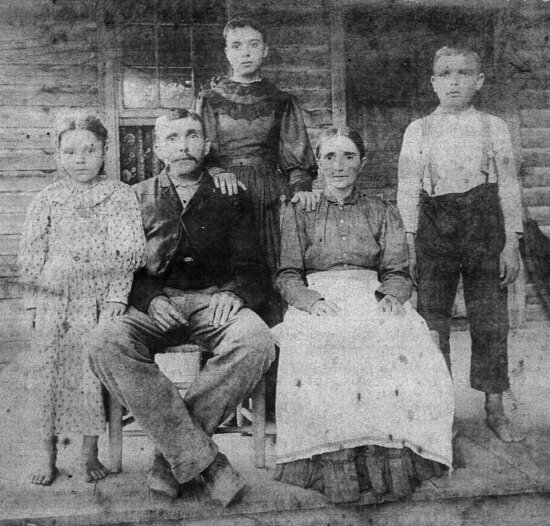 By 1850 brothers John, Aaron, and Asa had been joined in southern Cherokee County by little brother Avery Abraham Hardin and his wife Amanda Kennedy, who were both hatters, like his father. All the others were farmers. In 1850, three brothers lived adjacent at Bluffton, with the fourth, John, being set apart about a mile east of the rest nearly on the Georgia line. Although two teen-age boys lived in Aaron's household in Tuscaloosa, neither was the right age to be Avery. Avery may have come directly from Anderson to Cherokee County. In 1859, on January 1, Avery under the name "Abraham A. Hardin" received a land patent of 40 acres at Peaks Hill, near present day Ohatchee, in what is now Calhoun County. It is there he raised his family. At least one son moved to Rome, Georgia, and Avery spent his declining days with that son. Some of Avery's descendants still live on Avery Road in Rome. Treaty dates according to Thomas McAdory Owen, Annals of Alabama 1819-1900: The first of these, concluded with the Choctaws September 27, 1830, was the treaty of Dancing Rabbit Creek. After preliminary arrangements at Cusseta, a treaty with the Creeks was made at Washington City, March 24, 1832. At the Council House on Pontotock Creek, in Mississippi, October 20, 1832, a treaty was entered into with the Chickasaws ... In anticipation of the cessions contained in these treaties many pioneers had rushed into the Indian country ... by the end of 1832 many thousands had located in East Alabama ... Out of the Creek cession nine counties were formed: Benton, Barbour, Chambers, Coosa, Macon, Randolph, Russell, Talladega and Tallapoosa. Owen again: "On December 29, 1835, at New Echota a treaty was concluded with the Cherokees, by which they ceded all their lands east of the Mississippi river ... Out of the lands embraced in this cession, the General Assembly, January 9, 1836, created Cherokee, DeKalb, and Marshall Counties." Asa A. Hardin (b. 14 Mar 1814) followed a similar path to Aaron, going to Tuscaloosa and there marrying Annis Ann Holmes of Hickory Grove, SC on 6 Sep 1836. He received two land patents of forty acres each adjacent to Aaron, one on 7 Nov 1837 and the other on 20 Sep 1839. (Other researchers report the first patent was recorded on 10 Nov 1835, making Asa the first to settle in Tuscaloosa County.) Asa held on in Tuscaloosa past 1840, and is found in Cherokee County's 1850 census. Eli Hardin was the first of the group to settle at Coosa, Georgia -- between 1838 and 1839. In 1840 he lived at Coosa. He married Jane Bolt on 2 Feb 1832 in South Carolina. Slightly younger than Eli, a mystery T. Hardin lived 6 houses away from Eli Hardin in 1840. The family was made up of a woman 20-30, a young man 15-20, a girl 5-10, and a boy under 5. The young man is too young to be the merchant A. Tabor Hardin (Not a relative). Joseph J. Hardin came directly to Coosa, Georgia between 1842 and 1844. In 1840 he lived in Laurens County, SC among three Bolt families. He married the sister of Jane--Amy Bolt, b. 1814 in South Carolina. In 1850 he was at Coosa, Floyd County, Georgia. Joseph, Eli, and Milton, the three supposed brother living in Coosa, were joined by Aaron Hardin relocating across the Coosa River sometime before September 1847. On that date Aaron married Mary Ann Calhoun, whose family lived at Coosa, after his first wife Adeline Holmes died in July 1845. It is not proven that Joseph, Eli, and Milton are brothers, or that the other more likely brother are brothers to them. According to a 2005 DNA test comparing a descendant of Eli Hardin to a descendant of Aaron Hardin (Jr.), there is a 55% chance Eli and Aaron are brothers. There is also a 55% chance they are first cousins. The brotherhood of John Hardin to William, Aaron, and Asa is questioned by a DNA test showing a distance of 3 to John Hardin's descendant. Tuscaloosa County Hardins: Case for William T. Hardin (b. ca. 1800, Pendleton District, S.C.) as brother #1: He has all the qualifications above stated -- he lived in the same township and beat as Aaron and Asa; his son Warren J. bought the land Asa had settled at Hickmans, as the area was known in the 1800's. Of course his age fits son #1 of Aaron Hardin, Sr. William T. Hardin was a veteran of the War of 1812. He owned land in Pendleton District from December 1826 to January 1831, he had an unmarried man living with him of Aaron, Jr's age, and he is believed to have lived for awhile in Franklin County, Georgia before going to Tuscaloosa. The first record of his appearance in Tuscaloosa was July 29, 1834. Brother 1: William T. b. abt. 1800, settled in Tuscaloosa, m. Catherine Smith. Brother 2: Joseph J.  b. 22 Apr 1802, settled in Coosa, Floyd Co., Georgia, m. Amy Bolt. Brother 3: b. 1804/3, unknown. Conceivably David Hardin of Benton/Calhoun County Ala. Brother 4: John, b. abt. 1805, settled in southern Cherokee County. Brother 5: Eli, b. 11 Apr 1808, settled in Coosa, m. Jane Bolt. Brother 6: Aaron, b. 21 Apr 1810, settled in Cherokee Co. and Coosa, Floyd Co.
m. 1: Adeline Alexander Holmes 2: Mary Ann Calhoun. Brother 7: Asa A., b. 14 Mar 1814, settled in southern Cherokee County, m. Annis Ann Holmes. Brother 8: Avery Abraham, b. 1815-20, settled in Cherokee/Calhoun/Floyd,  m. Amanda Kennedy. Brother 9: Milton R., b. 2 Sep 1821, settled in Coosa, Floyd County. m. Eliza Jane Weathers. William Franklin Hardin and Z. Lizzie Howard. Children L. to R., Julia, Emma, Lauson, about 1894. Photo supplied by grandson of Emma, J.T. Bishop of Rome, Ga.